While this blog focus mostly on young adult literature, I am also a lover of picture books. As a former teacher and current parent (my daughter is three-and-a-half, in case you’re wondering), the picture book collection in my house is extensive. I considered blogging about a classic like Goodnight Moon or The Very Hungry Caterpillar, but in the end I just couldn’t. 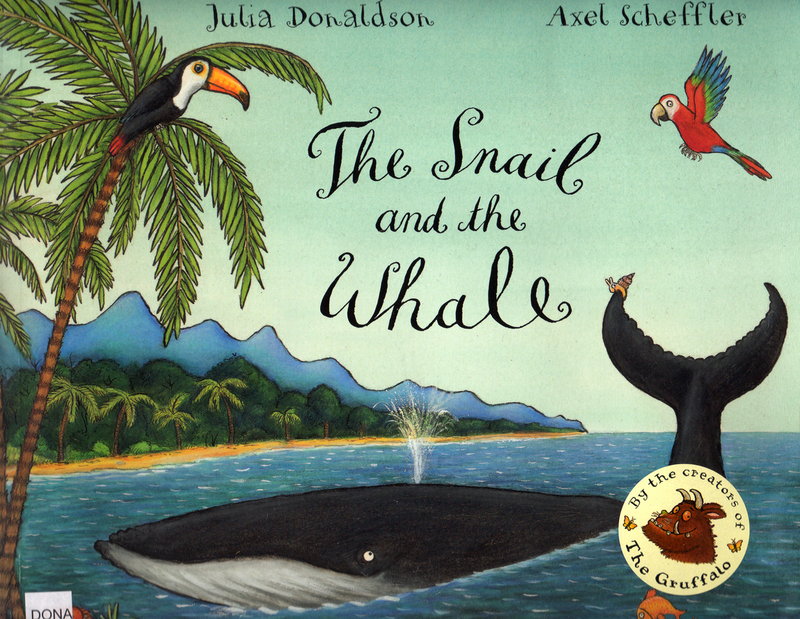 While I love those books (I give them as shower gifts anytime a friend has a baby), there’s another book I kept coming back to, one I bought for my daughter on a whim at the Seattle Aquarium about two years ago: The Snail and the Whale by Julia Donaldson, illustrated by Axel Scheffler. From Goodreads: When a tiny snail meets a humpback whale, the two travel together to far-off lands. It’s a dream come true for the snail, who has never left home before. But when the whale swims too close to shore, will the snail be able to save her new friend? The verse in The Snail and the Whale is adorable. I’m such a sucker for rhyming picture books, and The Snail and the Whale is done exceptionally. I know nothing about poetry, but the lyrical rhythm of this book reminds me of Lewis Carroll’s The Walrus and the Carpenter. The form probably has a name, but all I know is that it’s quick and bouncy and perfectly appropriate for the tone of the story. Speaking of the story, this one makes me smile every time I read it. The snail has an “itchy foot” and wants to leave his rock to see the world. He hitches a ride with humpback whale and the two explore oceans near and far. Then the whale becomes disoriented in a busy harbor and runs into trouble. It’s up to the tiny snail to save his friend, and the tension during the climax of the story is palpable, especially considering we’re dealing with two fictional animals. You’ll find yourself rooting for the snail and whale as if they’re your greatest friends! This book has gorgeous illustrations. They held my daughter’s attention even when she was much younger. Colorful, detailed and unique, they’re a perfect complement to the story. If you haven’t read The Snail and the Whale, I highly recommend you check it out. I think you’ll be glad you did. 🙂 And don’t forget to click HERE to read the other “My Favorite Picture Book” entries! So, what’s your favorite picture book? RTW: Like… Anyone but myself! I’m jotting it down right now! I’ve never heard of this one, but it sounds fantastic. I love the “itchy foot” description! Thanks for hosting such a fun blogfest, Megan. It was great to “meet” you and all of the other participants. I’ve never heard of The Christmas Orange. Love the title though, and stories set during Christmas time always make me nostalgic. Thanks, Yahong! I am a sucker for stories with animal partnerships. I like the artwork on the cover of THE SNAIL AND THE WHALE, too. I loved THE MONSTER AT THE END OF THIS BOOK and Richard Scarry books as a kid. Haven’t read this one, but I probably should. Thanks. I don’t know this one, am totally writing it down. Thanks! I have a feeling I am going to wish I had a little one to read some of these books to! Perhaps I should start making a list now so that when my kids start having children, I will have some highly recommended picture books to give them! This looks like a lovely book with a very cute little story!!! Thanks! That sounds like quite the pairing, snail and whale. Would make for an interesting story to say the least. You’ve got me! I’ll be checking this one out the next time I am at the library. Sounds beautiful on several levels. Thanks for introducing me to yet another ‘new’ book. Oh gosh, I’ve never heard of this one, but I think I’ll have to order it up for a few of the kids I know… and sneakily read it first to find out how the snail pulls it off! I chose The Lorax for mine, but The Snail and the Whale runs a close second. I adore Julia Donaldson’s books. She has a remarkable talent for telling an interesting story in a beautiful way. I have so many picture books. Somehow I’ve missed this one. I’m finally hopping over for the blogfest and posting my favorite PB today. This sounds like a really sweet read! Oh, I LOVE Julia Donaldson! Have you read any of her others? The Gruffalo is my favorite. It is so clever! Tyrannosaurus Rex is also fantastic! I pretty much own them all. You know, I haven’t read The Gruffalo, and I know it’s one of her most popular books. Time to seek it out at the library, I think!